A school bus with Jewish symbols on it was lit on fire in Brooklyn. 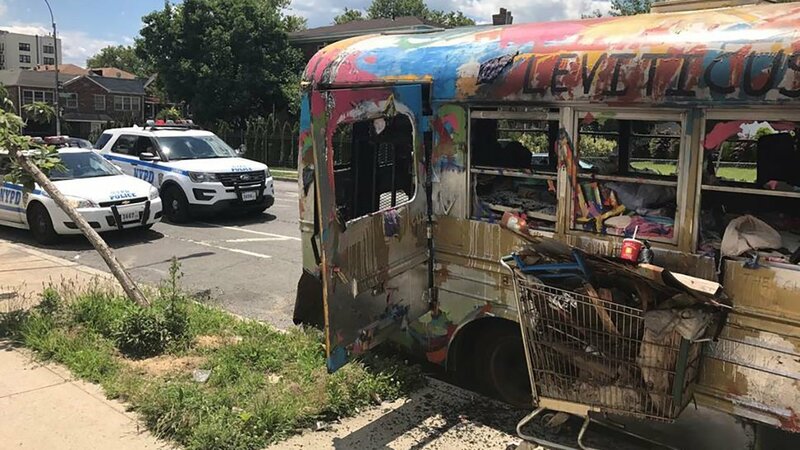 CROWN HEIGHTS, Brooklyn (WABC) -- Police are looking for a man who they said lit a school bus decorated with Jewish symbols on fire in Brooklyn. The incident happened around noon on June 26, when authorities say a man went up to the school bus set it on fire. The bus, dubbed the "mitzvah" by locals, was severely damaged. It has become a staple in the Jewish community, thanks to its religious imagery and vibrant colors. The person of interest then fled on foot on Troy Avenue towards East New York Avenue in Crown Heights. He is described as a black man, last seen wearing a white short-sleeve T-shirt with writing on the front, black pants, and a black baseball hat worn backwards.